INTERESTED IN JOINING BROMLEY ROTARY? Sponsored ‘digital display’ Community EVENT Notice Boards around the centre of Bromley. Deserving causes and Charities can use to display and promote details of their forthcoming Events. This is a FREE service. We are arranging to have several sponsored ‘digital display’ Community EVENT Notice Boards around the centre of Bromley. 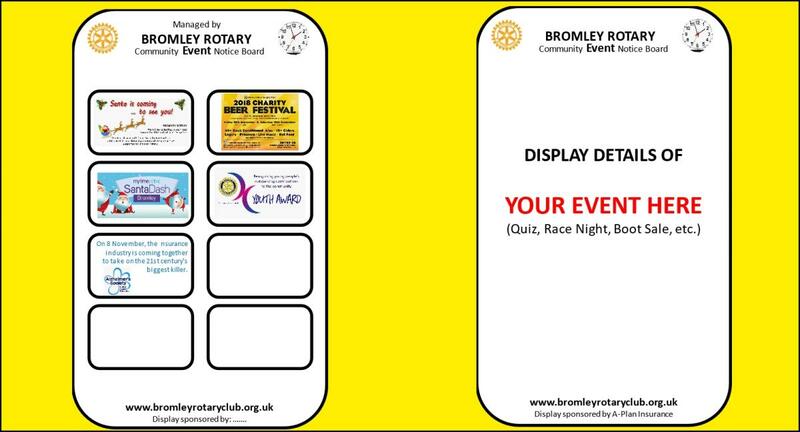 These will allow the many charities and deserving causes that operate in Bromley to display and promote details of their forthcoming events (Quizzes, Race Nights, Fun Days, Boot Sales, etc). The content of the display will be updated weekly. The sponsor of the first digital display is A-Plan Insurance and it will be in the window of their office - just outside the north entrance to the Glades. This first display will enable us to trial and fine tune the idea, which we plan to start during May 2019. If you are interested in using the service to promote one of your EVENTS, please contact Vic Hope at Bromley Rotary. You can see more details about how we see by clicking here.